Not all aircraft are actually fitted with brakes, however it is highly unlikely that you will ever fly one. Aircraft brakes are disc and are hydraulically or pneumatically operated. The main wheels only are braked, and most aircraft are fitted with differential braking. This means that the left or right brake can be applied individually, which enables the aircraft to turn about on its axis. This is a useful for tight manoeuvring. 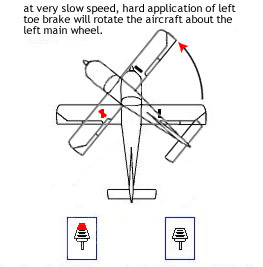 In aircraft with a castoring nose wheel, not connected to steering), the use of differential brakes is the only way that the aircraft can be steered on the runway below the speed of rudder authority. Too heavy an application of brakes (unless really necessary) will result in rapid pad wear and flat sports on the tyres. Some aircraft have an independent handbrake that will apply the brakes evenly onto both main wheels (Pipers). 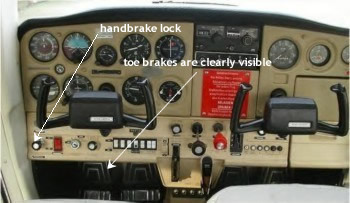 Other types, (Cessna, Mooney) require that the toe brakes are applied and then a knob has to be pulled out to lock the brakes.